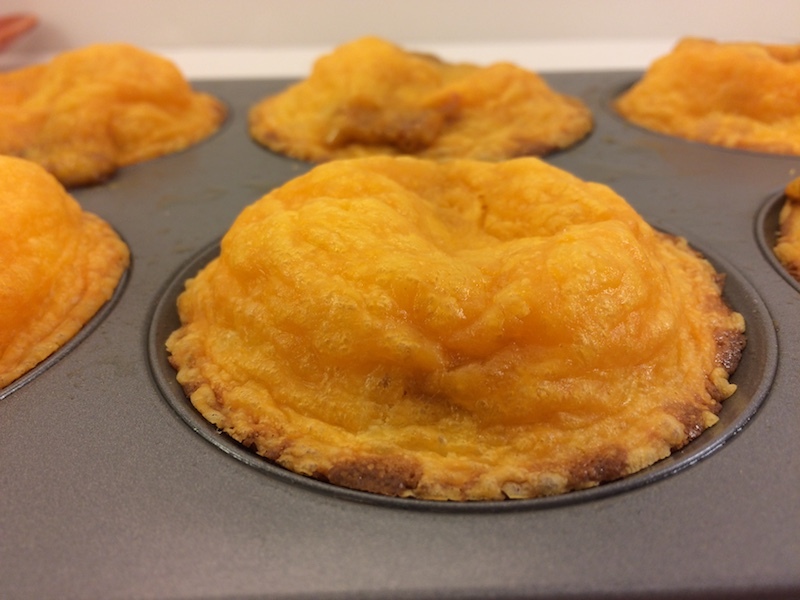 The idea for these “cupcakes” is from Parents magazine, but the recipe seemed time consuming – especially since I wasn’t preparing to teach a child about cooking. They made homemade chili and then added eggs to bind it all together whilst baking to create a more solid form of chili. If I’m going to make homemade chili, I want to enjoy each spoonful, and dip in a piece of cornbread once and awhile for a change in texture. While they looked delicious, I wanted something easy and I wanted cornbread! So, since simple was on my wish list, I also wanted to use fewer ingredients. These cupcakes are one of the easiest things to throw together and, although we usually serve them with a southwest salad, it’s almost a full meal in itself. 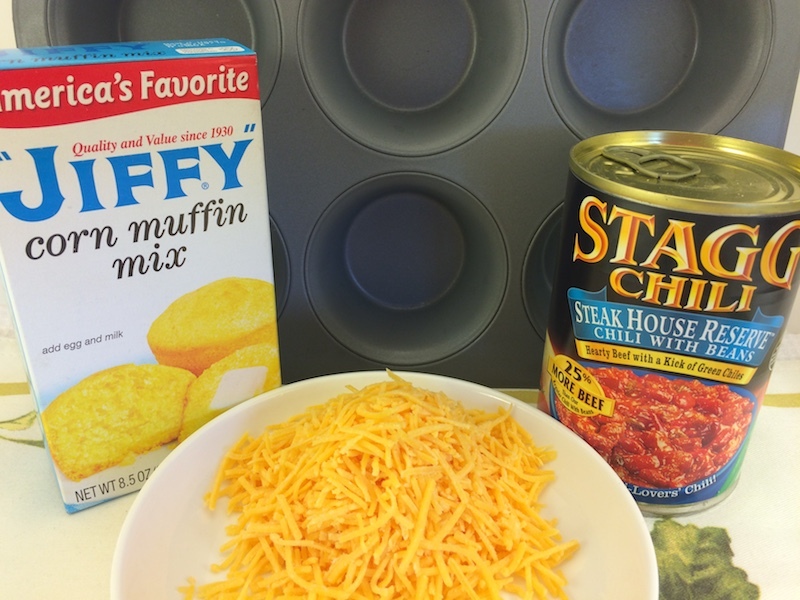 With these 3 convenience items (plus an egg and milk for the cornbread mix) you can turn out chili with cheese and cornbread in no time! The best part is that you don’t need any serving plates or utensils – just grab and go. To assemble these little beauties you need the above ingredients (or similar if you’ve got favorite brands, just make sure its a thick hearty chili). Grease (or spray) the muffin pans first so that the Chili Con Cupcakes will pop out easily after baking. Alternately, you could use muffin pan liners. Make the cornbread according to the package directions by stirring in 1 egg and 1/3 cup milk with a wooden spoon. Then pour the mixture into a regular sized muffin pan – filling 12 holes instead of just the 6 that the package usually makes. Place about 1 heaping tablespoon of chili into the center of each cornbread mixture. Sprinkle each muffin with about a heaping tablespoon of shredded sharp cheddar cheese. 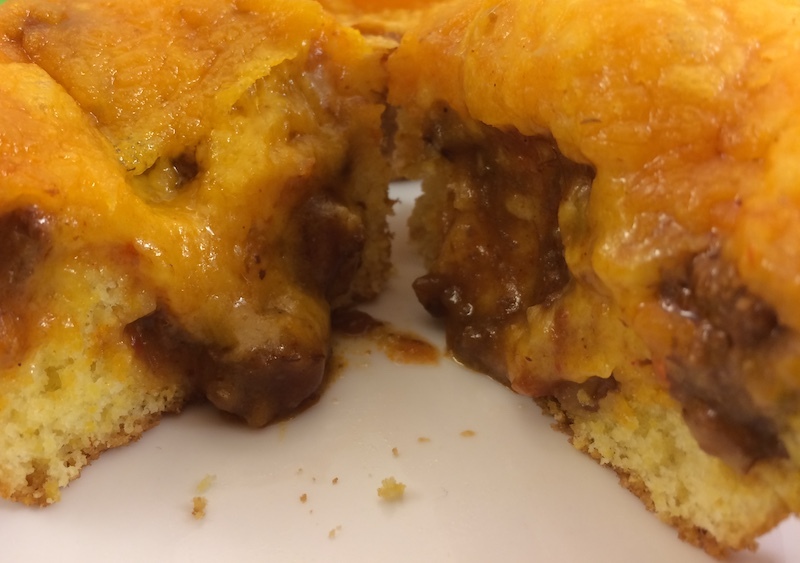 Let the cheese peak in the middle and completely cover the muffin hole, but not hang over. Place the muffin pan into a pre-heated 400°F oven for about 12-14 minutes. The tops will have risen up and the edges will begin to turn golden brown (but the centers will not completely peak like a regular cupcake due to the chili). Surprise! Look at all that yummy goodness sealed inside. 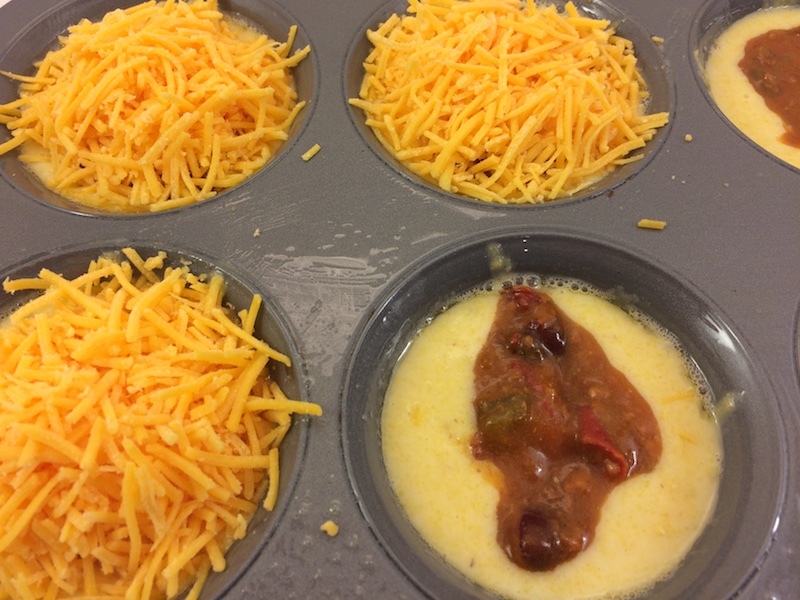 The cornbread cooked perfectly, the chili is hot and the cheese formed a perfect covering to it all. Go a step further, if you like, and pipe a dollop of sour cream on top to make your kids think you’ve lost it and are serving dessert for dinner! These also make a great lunch for a crowd. 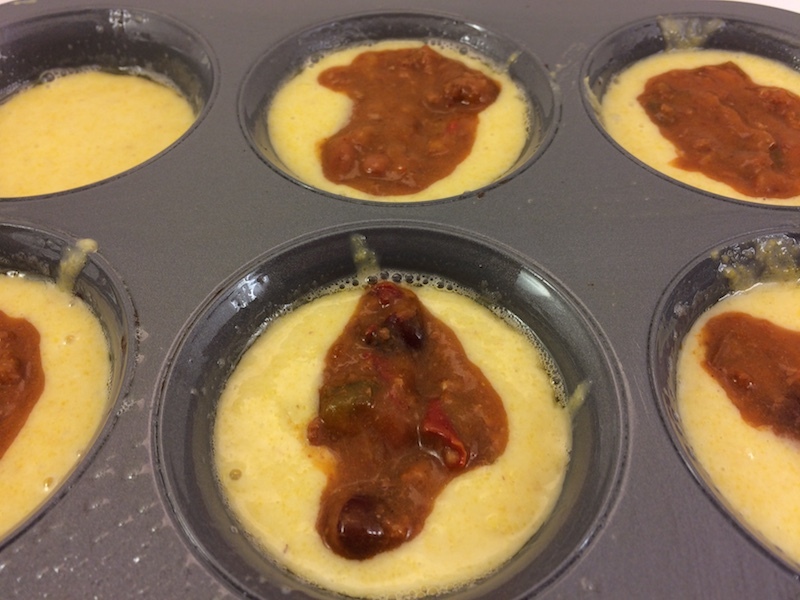 Chili Con Cupcakes should be taken from the muffin pan after baking and eaten while still warm. Store any leftovers in the fridge, they can be briefly microwaved to reheat. More muffin pan ideas and recipes can be found in our muffin pan post. For information on the shelf life of cornmeal, check our cornmeal page. To find out what happens to cornbread mix beyond its eat-by-date, see our expired cornbread post.